As has been our tradition since the girls were babies, we’ve added a few new books to our Christmas book basket this year. The Christmas Miracle of Jonathan Toomey by Susan Wojciechowski is one of those books I’ve seen around for a long, long time. I even watched the movie years ago and enjoyed it. I picked up a hardback copy up at Goodwill sometime during the past year, and I’m glad I did. It’s a highly sentimental story, but sometimes that’s just the thing at Christmas. If you don’t know the plot, it might best be summed up this way: lonely widowed mother and son befriend a crochety neighbor who has a sad secret of his own, and a miracle of love and healing takes place just in time for Christmas. P.J. Lynch‘s illustrations are lovely and perfectly fitting for the tale. (Candlewick, 1995) We also added the movie to our Christmas collection because how could we not watch the movie after reading the book? We have also added a couple of books related to the real story of Christmas this year. The children will have a copy of Silver Packages: An Appalachian Christmas Story by Cynthia Rylant to open tomorrow at our Christmas Eve brunch. I purchased this on Alice’s recommendation, and I look forward to sharing it with them. 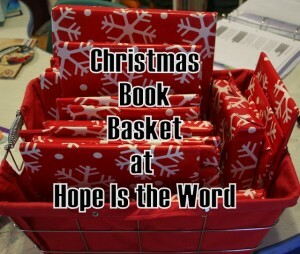 We’ve also been reading chapter books this Christmas, and I hope to share more about those in the next week or so. Books are a huge part of our Christmas celebration. Have you read any new or new-to-you Christmas books this year? I’d love to hear about them! I’ve been reviewing picture books each Sunday for December. Over half are new-to-me!!! Of the new-to-me I really, really loved Mr. Willowby’s Christmas Tree by Robert E. Barry. Lovely! The only book on your list that I’ve seen is The Christmas Miracle of Jonathan Toomey. Once again you are introducing me to new books! I posted my list a little while ago, and I’ll link it up to RAT next week. Favourite new-to-us books? One Wintry Night by Ruth Bell Graham, and Stephen’s Feast by Jean Richardson.